I opened your article thinking I was going to find the name of a deep dish pizza restaurant worth flying to, not a New Year’s resolution for healthy eating. So … how about a tip for those of us drooling over the photo. Where was that pie? For the record, that pie was at my favorite pizzeria in the world: Lou Malnati’s in Chicago. Instead of just giving you one pizza that’s worth hopping on a plane for, though, how about six? Here are enough out-of-this-world pizzerias to count on one hand — assuming you were born with six fingers. To me, there is no finer pie. Actually, pie is a fitting name for this beauty as it more closely resembles a thick slice of apple pie than a Frisbee. A nice, firm crust stands up to a dense layer of cheese — full slices of mozzarella, not shredded in order to keep the cheese more cohesive — and a blanket of barely-crushed tomatoes on top. While most pizzas have a tomato sauce, these tomatoes are more of a topping in and of themselves. 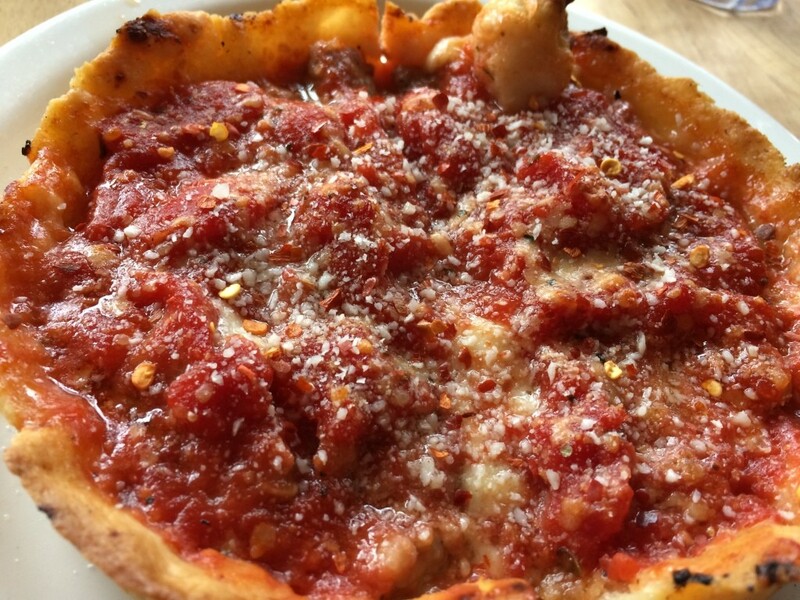 For a cold winter day, there’s nothing that fills you up better than a few slices of Lou’s. Heck, I’d even eat it on the hottest day of summer. My adopted city of Los Angeles doesn’t get a lot of credit for our pizza game, but there’s a lot of great ‘za here. While we emulate the styles of other cities quite well (I’d put Vito’s white pie up against most New York pizzas any day), we actually have a style all our own and it’s due to Nancy Silverton over at Pizzeria Mozza. When she teamed up with Mario Batali and his restauranteur partner Joe Bastianich, the collective LA fooderati went nuts. Mozza was a revelation. It looks like a classic Neapolitan pie, but with a crispy crust and distinctly California toppings, this was a new iteration worth waiting up to three hours for. Squash blossoms, Fresno chiles, and the best damn fennel sausage you’ve ever had are on the menu and the real geniuses opt for the Bacon, Salame, Fennel Sausage, Guanciale, Tomato & Mozzarella — aka the Meat Lovers’ Pizza. It may sound crazy, but pizza experts across the country agree that the best pizza in America happens to reside in Phoenix. I’ve never been to Chris Bianco’s restaurant there, but I have tried it at LA’s excellent LA Loves Alex’s Lemonade Stand fundraiser and I have to say, it’s wonderful. Bianco’s pizza is so bespoken that for years, he was the only one allowed to make the pizzas. He’s loosened the reins a bit and even opened a new location in Tucson this past summer, but the six pizzas on Bianco’s menu are still considered magical. The guy’s so obsessive about his product that he even has special tomatoes grown just for him. Arizona: Home of America’s Best Pizza? Believe it. On a cold New York day many years ago, I took two trains and a bus out to a tiny section of Brooklyn where I found pizza’s equivalent to Yoda. I’m not the only one who’s made the trek to Domenico DeMarco’s shop in Midwood. His pizza has been lauded far and wide and for good reason: it’s the New York-style pizza of your dreams. It’s just Dom back there with his pair of scissors for cutting fresh basil onto every pie and a little can of oil that he generous disperses over the cheese. The journey is half the fun of the experience, but the pizza is what makes it wholly fantastic. Portland is known for its all-artisan, all-the-time ethos and Ken Forkish embodies that with his bakery and pizzeria, both in PDX. There are eleven pizzas on the menu and you can’t call in for take out. You’re welcome to wait for one to take home if you show up, but they do so much volume in-house that you’re not guaranteed a chance to enjoy it outside the confines of the restaurant. That’s a pretty big testament to the quality of the pie, no? Portlanders love waiting for this pizza and you will, too. Ask anyone in Connecticut what the best New Haven-style pie is and you’ll get one of three answers: Sally’s, Modern, or Pepe’s. It’s all a matter of taste, but Pepe’s more than holds its own with a bonkers clam pizza that will change your mind about seafood as a pizza topping. The old brick oven in the original location has been cranking out high-quality pies since 1925 and with newer locations all over Connecticut, that’s not about to stop any time soon. What’s your favorite pizza worth flying for? Tell me in the comments. Written by Jason Kessler, an internationally known journalist specializing in food and travel, Fly and Dine is a blog that focuses on the Jason’s love of food and the joy of culinary discovery. From fine steakhouses to the popcorn kiosks at ORD, if it’s good, Jason is eating it and writing about it! Jason is a regular columnist for Bon Appetit, Food Republic and Organic Spa as well as a freelance writer for a host of other publications.